It’s reall­y no surprise that you see Pyrrha jewelry being worn by celebrities, movie stars and ultra-cool people. Why? Because, amongst other things, they are seriously awesome. Each talisman is uniquely handcrafted. No two pieces are exactly alike. And every piece carries its own meaning, and the rich history of the heraldic seal the stamp is cast from, preserving the original dents and cracks that can only result from time, use, love. 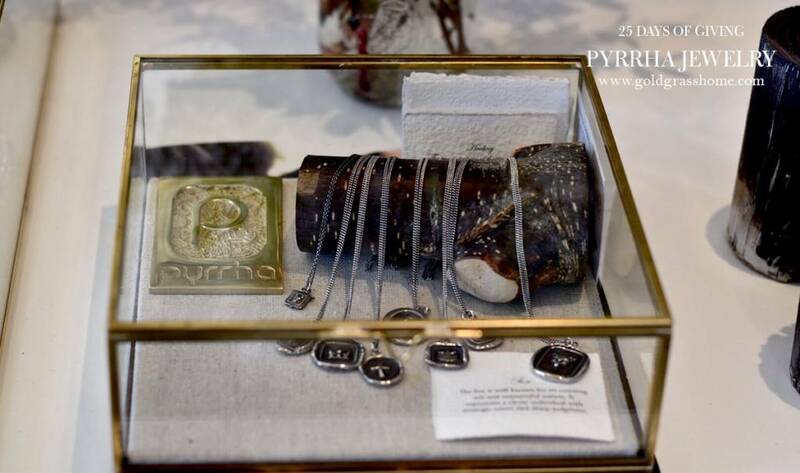 Along with the timeless imagery, Pyrrha has added a story for each piece. What story sums up your feelings? This is no mass-produced, run-of-the-mill, stuff. These pieces are delicate yet rugged. Beautiful, yet profound. Available in different metals; silver, bronze, with a fine, delicate chain, or maybe it’s an occasion for pearls…? Truly a special gift for that special someone on your list. We’ve raised the stakes for our 25 days of Giving campaign. By taking part, you’re not only getting awesome natural gifts for friends and family, and helping us support a great cause, you also get 10% off the daily feature, and now 15% of the sale will be donated. And you’re also entering to win an Ultimate Spa Kit, valued at over $1000. It’s an amazing gift pack stuffed full of the world’s finest and most luxurious skin and spa products, bath linens and other goodies!